Things I liked: Very easy to install on my 4-12X40Tech Force scope. Easy adjustments to dial in the laser for accurate night shots. Got a rabbit at 30 yrds with a clean head shot with my Benjamin Marauder last night!! Things I would have changed: How about a heavier duty construction material, other than all plastic. Better 2 way tape to attach the remote switch to the gun. 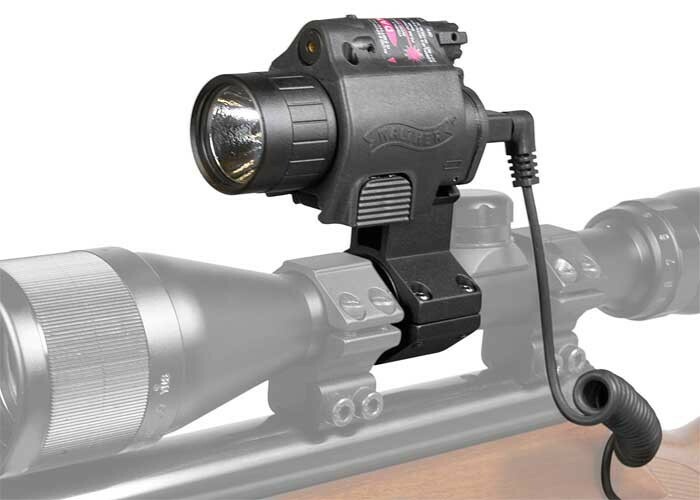 What others should know: Easy to remove the laser/flashlight unit without having to remove the laser/flashlight mount from the scope. Take it off the main unit when you don't want it, snap it back on when you do. Very convenient when travelling. Other units have a separate switch for the light and one for the laser. This laser/flashlight remote(only one remote needed) allows you to turn on both the laser and flashlight at the same time without having to press two separate remotes. What others should know: Junk wont get lazer to stay recoilknocks light off ..not very tough. Worth abot 20bucks...dissapointed.. Things I liked: I had my reservations about the lumens of this unit, however I have found it to be extremely adequate for my uses. The combination of laser and flashlight is fantastic. It mounts nicely and the added ability of the pressure switch makes this a great unit. It is light enough to use on my Sig P226 as well as the Benjamin NP2 without distracting balance. What others should know: For anyone who needs a flashlight that provided sufficient light and is weight conscience this is the unit to have. Things I liked: it give a good looking on your rifle and light, raser too. Things I liked: flashlight come with the laser is great i used for the first time shotting pigon at my job wow nice. What others should know: Hey thanks again for lettin us California buying please help us fight ours goverment their stupied law is not gun that kill people is the sick people are killing prople. Things I liked: Flashlight is nice & bright. The single pressure switch to control both the light & laser functions. The ability to use or not use the pressure switch to control the unit. The quick release mounting. Things I would have changed: 3 different Alan keys. Either change the mount's screw heads to match the battery compartment's screw head or vice-versa. Some form of Zero Lock for the Laser's windage & elevation adjustments. What others should know: Laser works well, the elevation?& windage adjustments are nice, but for me, it falls out of adjustment too often. My Hatsan 125 Sniper in .25 Cal does have a kick to it. I'm considering moving it from above the scope to the barrel mounted rail. I like the flashlight being above the scope though. Things I liked: Sturdy but lightweight. Easy to setup and the laser holds well on target regardless whether the unit is removed. Things I would have changed: Tighter laser dot. What others should know: Light illumination suffers past 25 yards. I only use the unit for up close night hunting. I wouldn't mount it on a spring or gas magnum. It looks and functions awesome on my Marauder though. Things I liked: Compact all in one laser and light with a single remote switch. I prefer a single remote switch instead of separate remote switches, one for the light, one for the laser. I can select the mode I want to use from the switch on the main unit, i.e., light and laser together, just the light, or just the laser. It has a quick release button so I can take it off the rifle and put it back on quickly. Things I would have changed: There is slight movement due to the quick release feature, so it is hard to keep the laser 100 percent zeroed, but it works well enough for me, though I would prefer no movement at all. What others should know: It doesn't shift much, but don't expect the laser to always be dead on accurate. Get a laser on a fixed mount if you need it to be super accurate. Things I liked: Very easy to set up and zero in. Works great. Things I would have changed: The spring for the battery compartment opens after each recoil of my Diana 34. This latch needs to be screwed down instead of the current spring latch system. I don't know if I just have a bad one, or if they are all like this. Things I liked: The way the control switches are setup and the ease of operation. The choices of what turns on with one press of the power switch. Nicely planned. Amazing what you get for the price. Light and laser are very functional for reasonable distances. Love the pair built together. Things I would have changed: The included mount of too tall for most applications. But, the built in Weaver/picatinny clamp base makes up for that. Really nice clip-on/clip-off. What others should know: I use mine on a .410 gauge shotgun (home protection) or a Smith & Wesson .22LR caliber target pistol. Easy to transfer over. Firearms-designed similar devices are 4 times the money and not a bit more suitable. Things I would have changed: I wish the laser dot was not so fussy. I also wish the the adjustment screws were longer so lock-tight could be applied. What others should know: I bought two of them. They installed easy. While zeroing the laser, the dot will move in a figure 8 pattern which I found out is normal after reading B.B's blogs on this web site. The laser dot is not as small and sharp as I thought it should be, that again is normal for the price. After reading up on lasers, I zeroed mine for half the distance of my scope, 33ft ( 10 meters ) and can hit anything in my yard. During testing I would lay the laser dot on the target without looking through the scope and fire. I hit the bullseye every time. At first it seemed that the laser dot would move after several shots. I tightened down the screws on each side of the laser...just a little and rezeroed and have had no problems. I have not tested if you have to rezero the laser if you remove the sight for any reason but since it fits into a weaver style base, as long as you place it in the same slots, there should not be a problem. I will test that soon.